Cooking rice with nuts has always been associated with big lunch parties in the eastern culture. It is being used as a side dish and sometimes meat, chicken, liver or other foods are added to enhance the meal and give another taste. 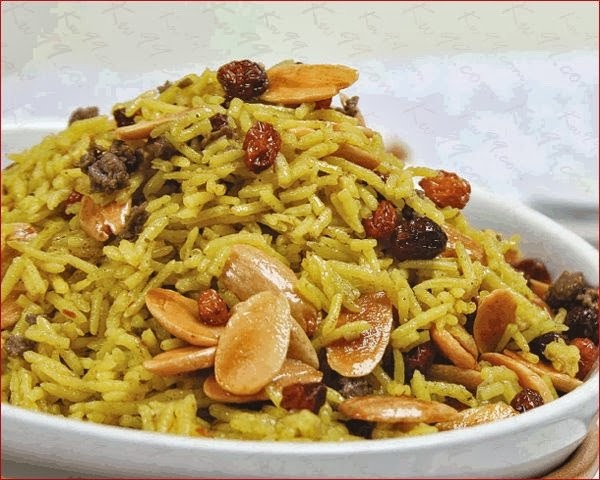 The rice with nuts meal is not so light or suitable for diabetes and heart patients. But we can not deny the fact that it gives high calorie and nutrient supply due to containing nuts and rice; so it is mostly an occasional nutritious meal. - 2 cups of brown, long grain rice. - ½ cup of raisins. - 2 cups of mixed nuts (almonds, cashew, hazelnut, peanuts). - soy oil or any type of zero cholesterol oil. - different spices ( pepper, ground cinnamon, ground clover, curry, meat spices, paprika). - salt and one dry lemon. - chicken or meat broth. Cooking this meal is not difficult at all, but you have to decide whether you want the nuts cooked within the rice, or you prefer mixing them after the rice is cooked. Start frying the onion on high heat in nearly 3 tbs of soy oil. When it takes golden color, add the carrots, raisins and nuts and fry on high heat. When all take golden color, add the spices and give it a turn, then pour the broth and put the washed, rinsed rice. Allow it to soak all the broth on medium heat, then cook on very low heat for 30 minutes. The other option is letting the nuts while frying only the onions, raisins and carrots, then add the spices, rice and broth. Before serving, use a small amount of butter to fry the nuts. When they take golden color turn off the stove and decorate the dishes with nuts on top of the rice meal.